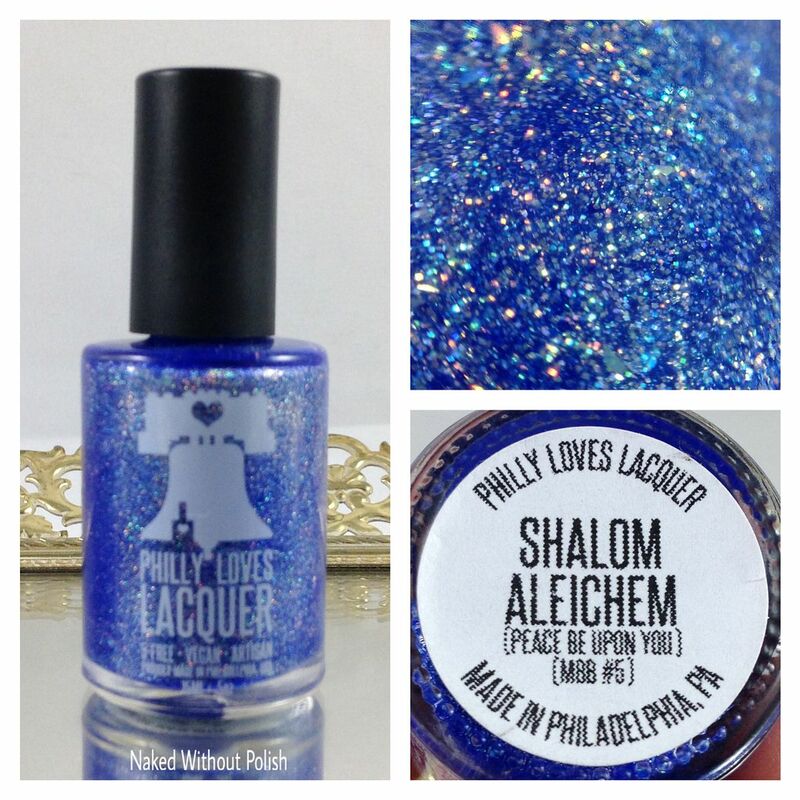 Philly Loves Lacquer's country of choice is Israel, and her contribution is Shalom Aleichem. Shalom aleichem translates to "peace be upon you" in English. 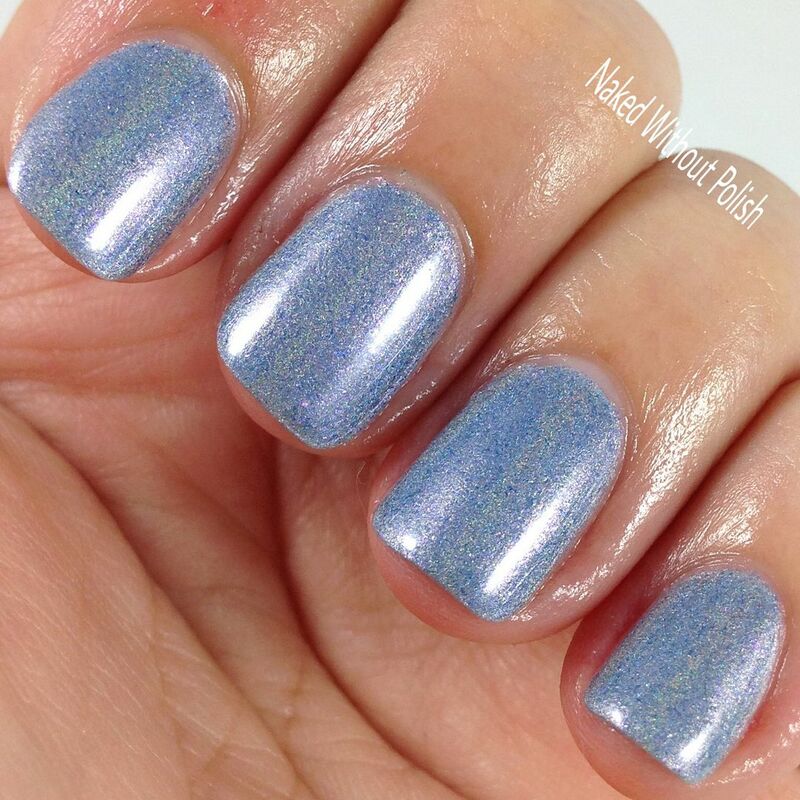 Shalom Aleichem is described as "a bright blue crelly with silver holographic micro flakes, holographic micro glitter, and a dusting of holo sparkle". 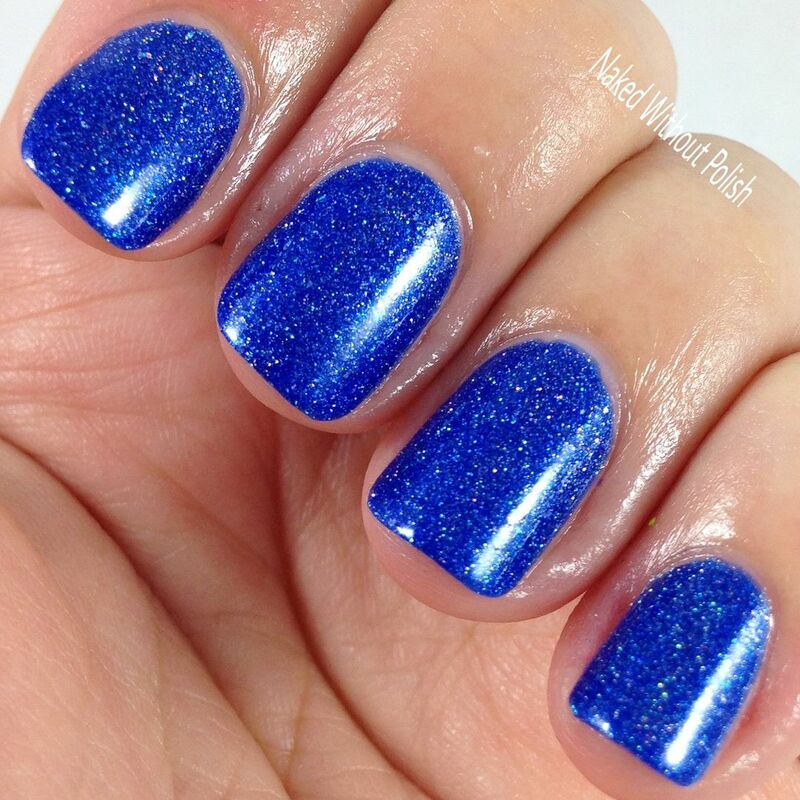 Shown is three coats of Shalom Aleichem with top coat. Shalom Aleichem had a smooth application and lovely formula. It is slightly sheer. I did three thin coats, but two normal coats would suffice. 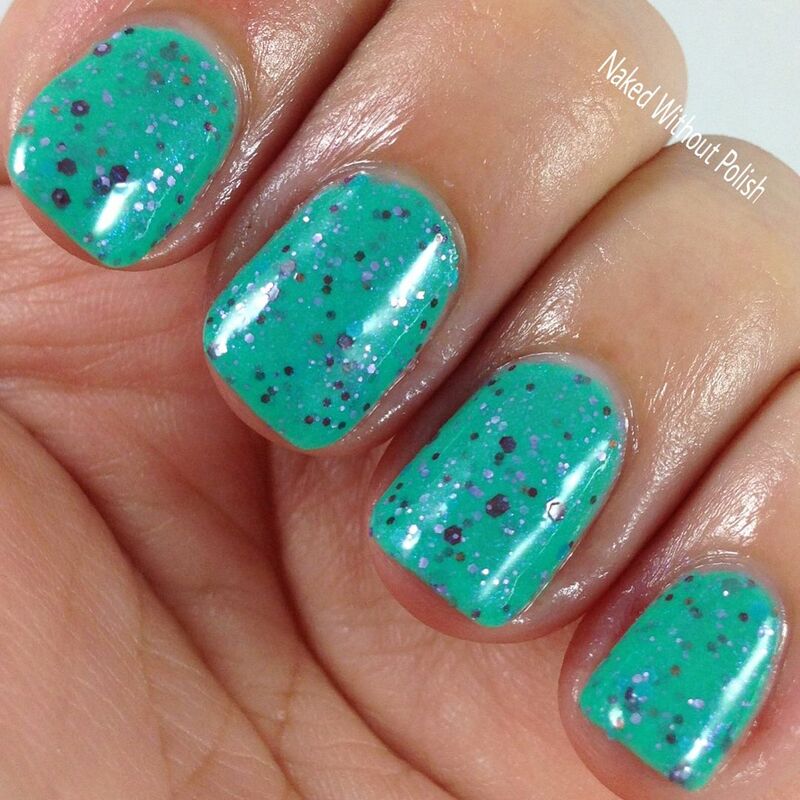 Easy to work with brush and no fishing for glitter. 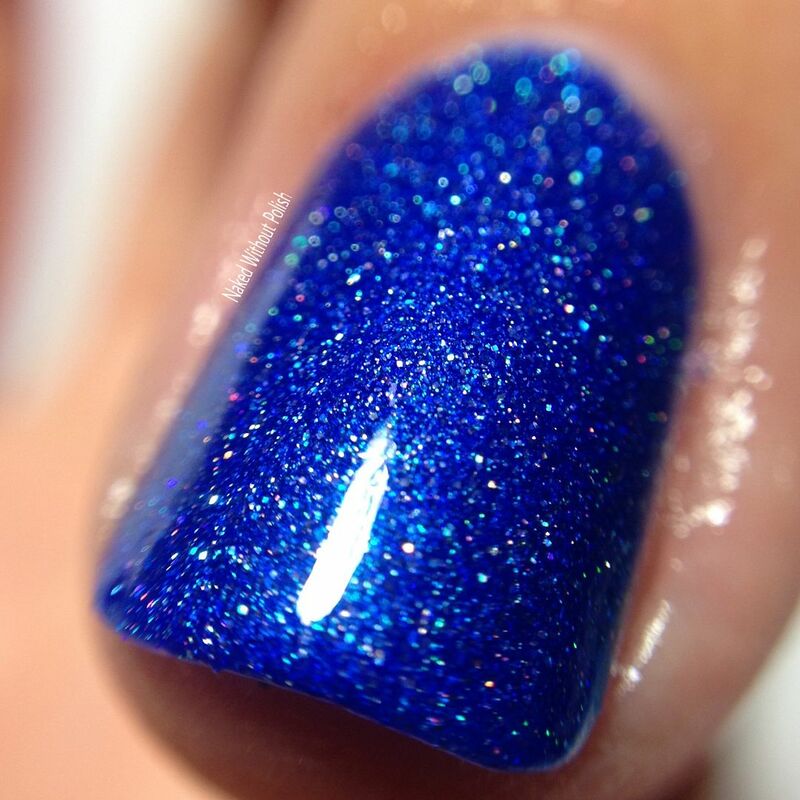 A beautiful polish that is perfect on its own or would be great as the base for some nail art or as an accent. 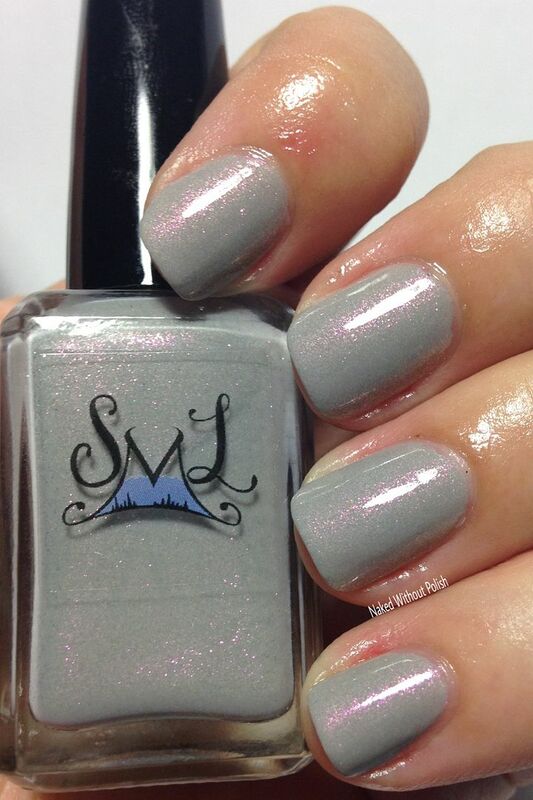 Smokey Mountain Lacquer's country of choice is France, and her contribution is Bonjour. Bonjour translates to "hello" in English. Bonjour is described as "a grey crelly with slight taupe undertones with gold shimmer and pink/red/orange iridescent micro flakes". 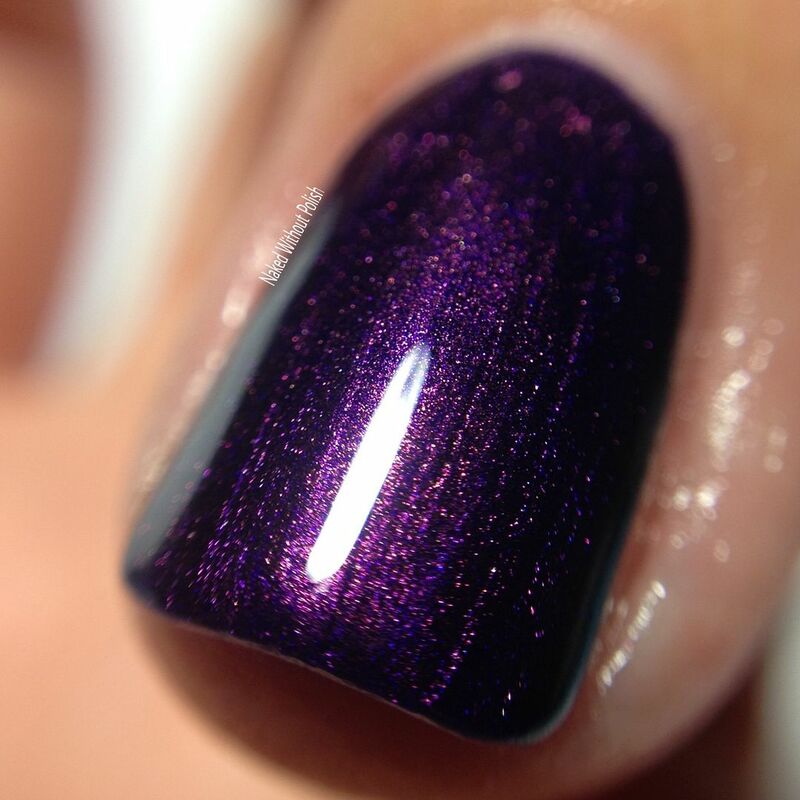 Shown is three coats of Bonjour with top coat. Bonjour is a clean, sleek, and subtle beauty. 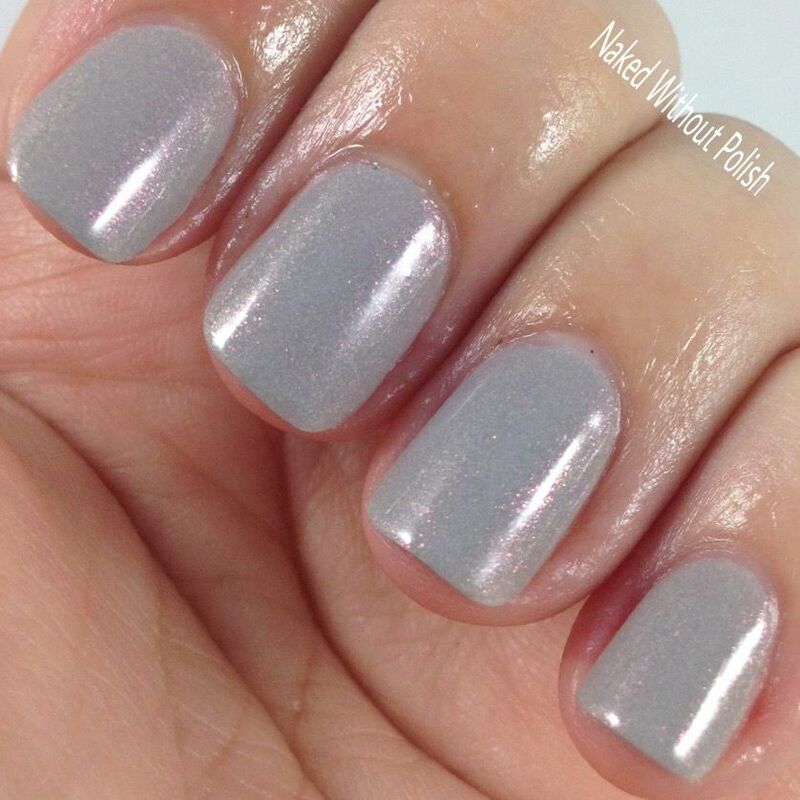 A great way to wear a neutral shade and get a hint of shimmer for those offices that are a little too strict with polish colors. I did thin coats and it was a little sheer so three was a must for me. Two thicker coats would have been fine too though. 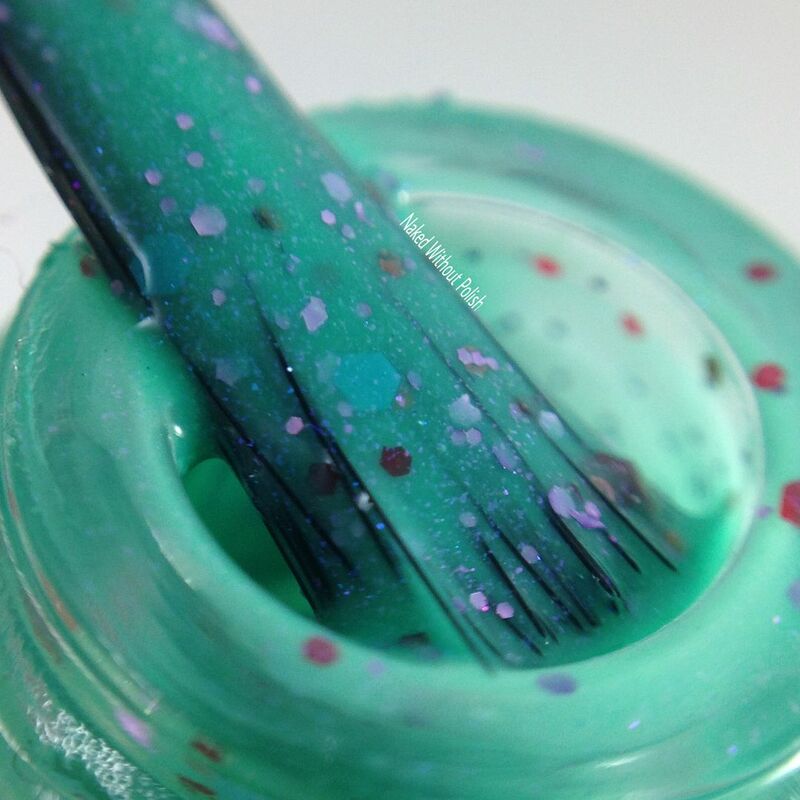 Would make for a great base for some gorgeous nail art! 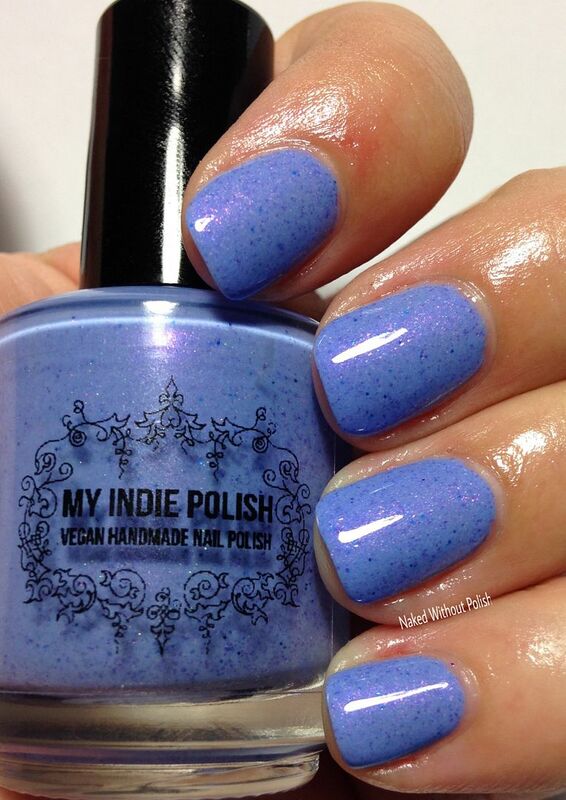 My Indie Polish's country of choice is Portugal, and her contribution is Bom Dia. Bom dia translates to "good morning" in English. 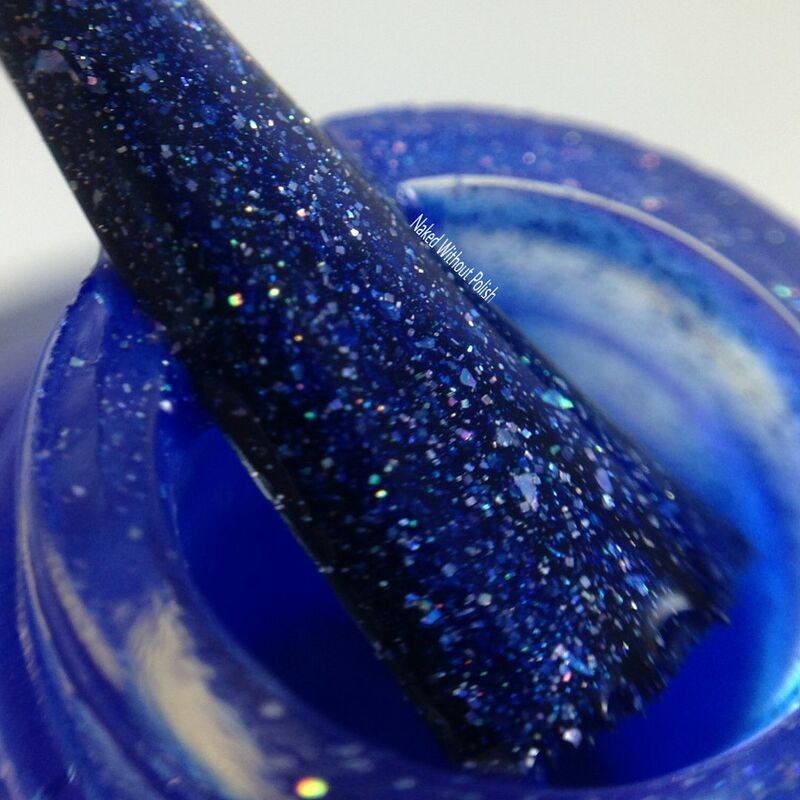 Bom Dia is described as "a hydrangea blue/periwinkle crelly with metallic blue micro glitter, purple micro flakes, silver micro flakes, pink shimmer, and blue/purple iridescent micro flakies". 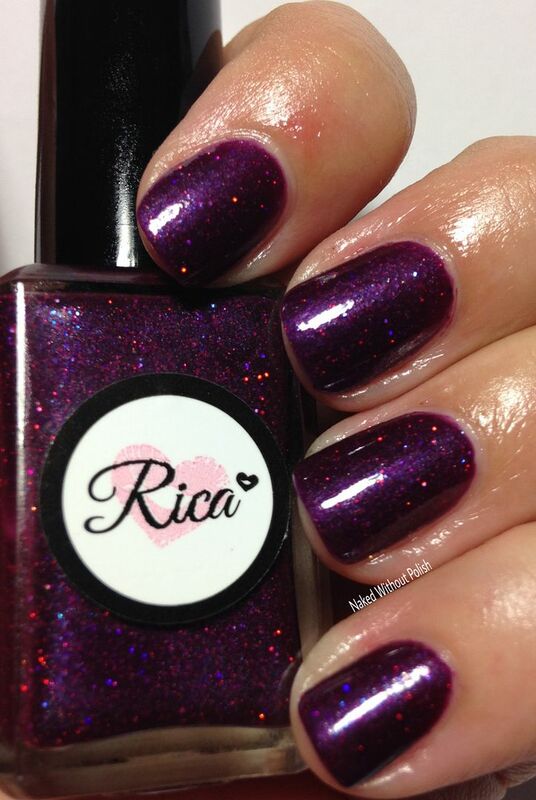 Shown is two coats of Bom Dia with top coat. Bom Dia is close to Tanya's heart. 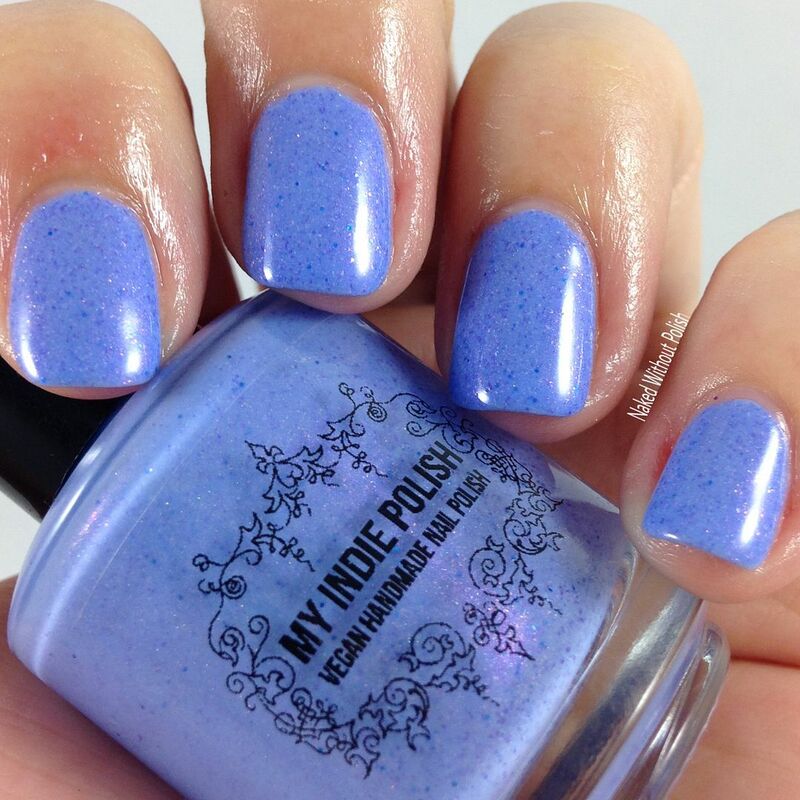 This polish is inspired by the hydrangeas that grow all over the island of Graciosa, where her husband is from. 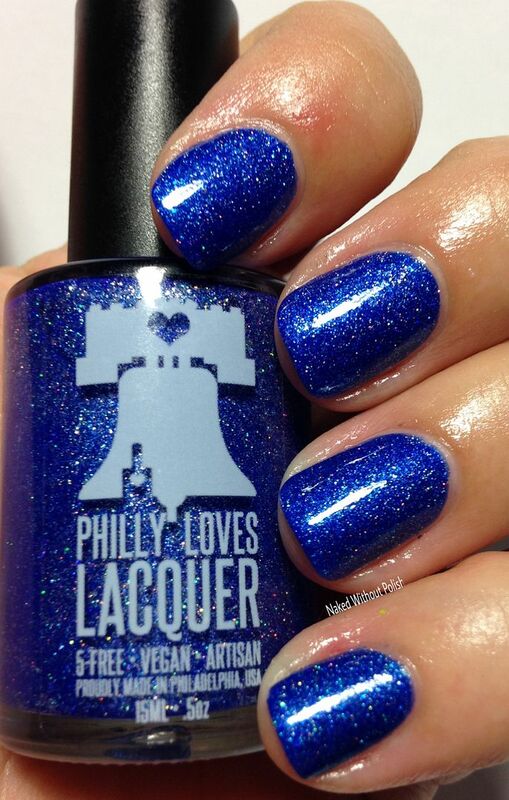 What a stunning polish, and a lovely nod to her husband's home country, right?! 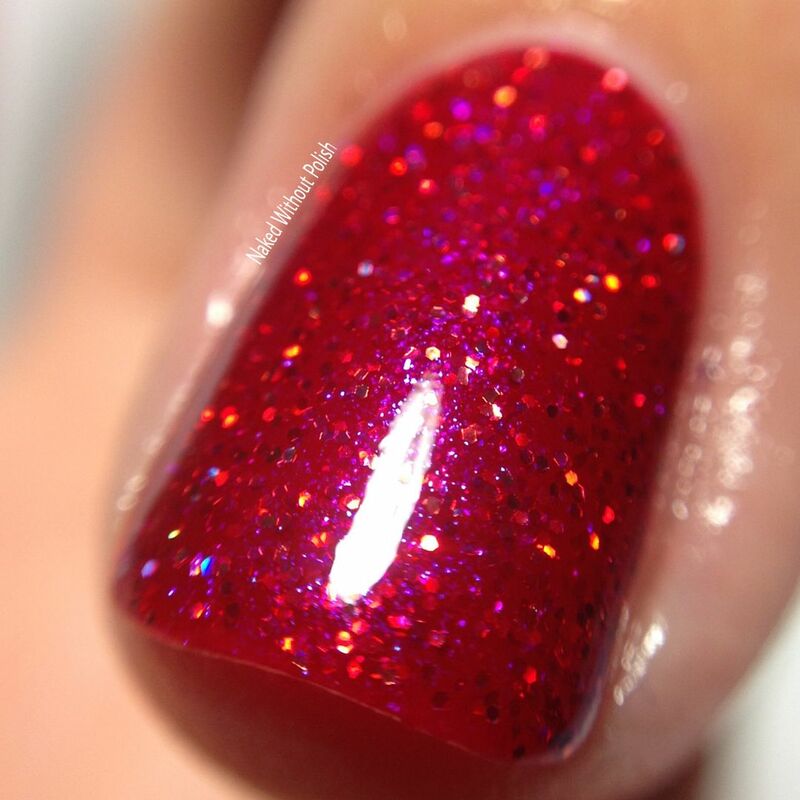 This polish was flawless in every way and form. Zero issues with application, brush, formula...and she completely nailed that color. It is the exact color I think of when I think of hydrangeas. It's nice knowing I now own my own little hydrangea! 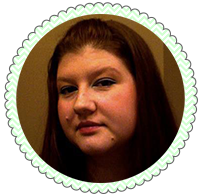 Rica's country of choice is Russia, and her contribution is Privet. Privet translates to "hello" in English. 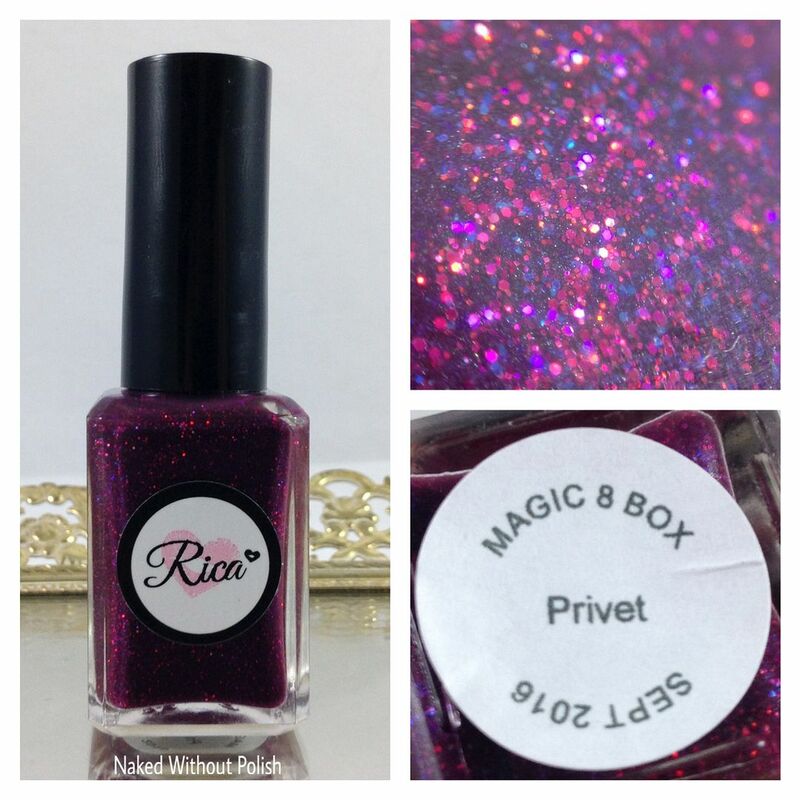 Privet is described as "a blackberry purple jelly with a slight blue shimmer, as well as blue, violet, and maroon holo and metallic micro glitter, and a holographic shimmer". Shown is three coats of Privet with top coat. Privet was the hardest to capture its beauty in pictures, and I honestly can't figure out why. 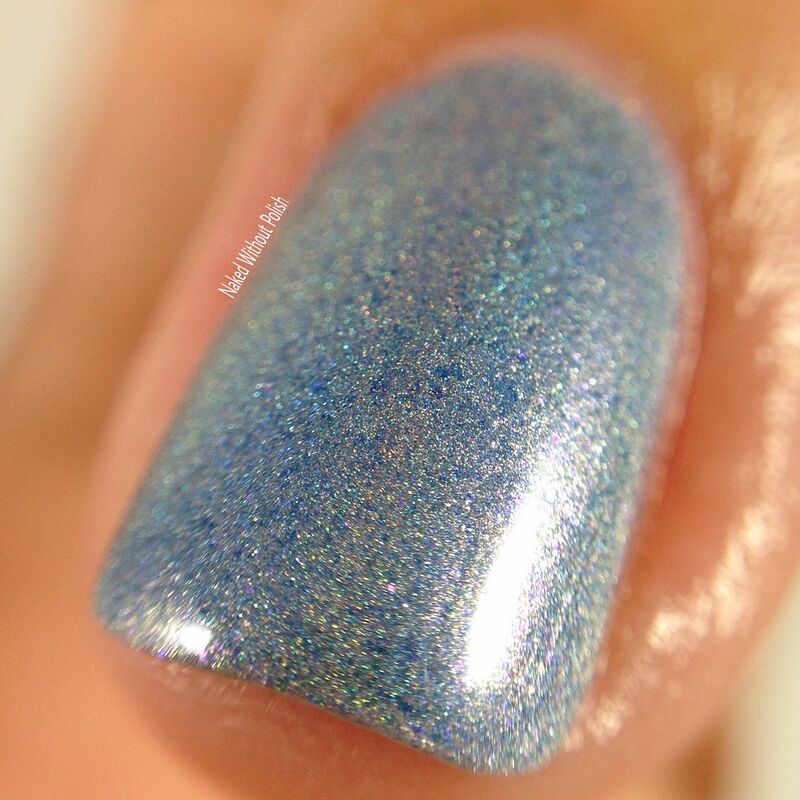 The hints of blue shimmer come out in the direct light photos, but the holo in the micro glitter didn't pop like I was expecting to. In person though, it is crazy sparkly. So trust me on this one. Application was great, just slightly patchy. It evened out and became fully opaque after three thin coats though. It probably would have been fine with two normal coats. 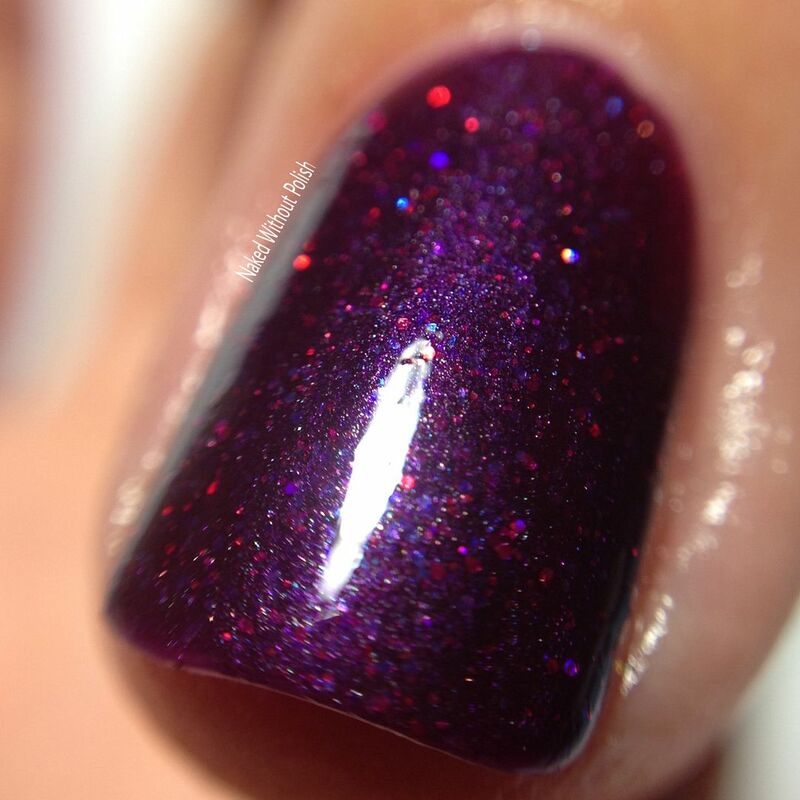 It's a vampy beauty you're going to fall in love with for sure! 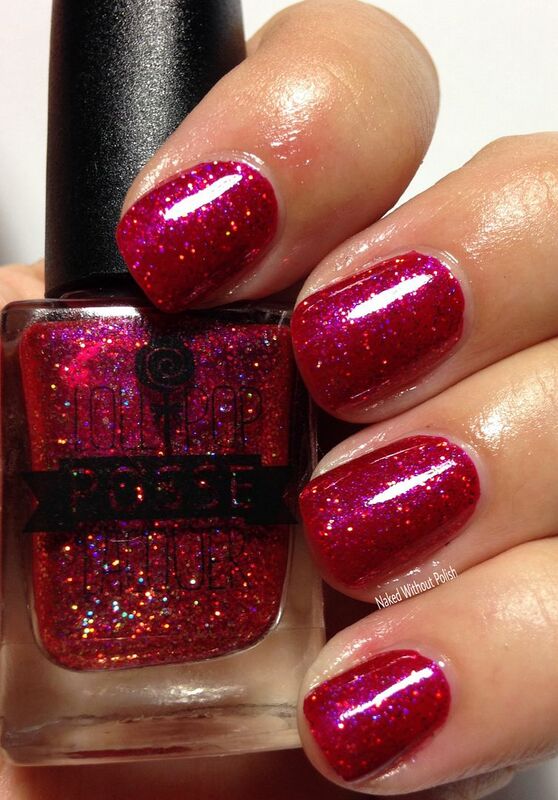 Lollipop Posse Lacquer's country of choice is Japan, and her contribution is Konnichiwa. Konnichiwa translates to "good day" in English. 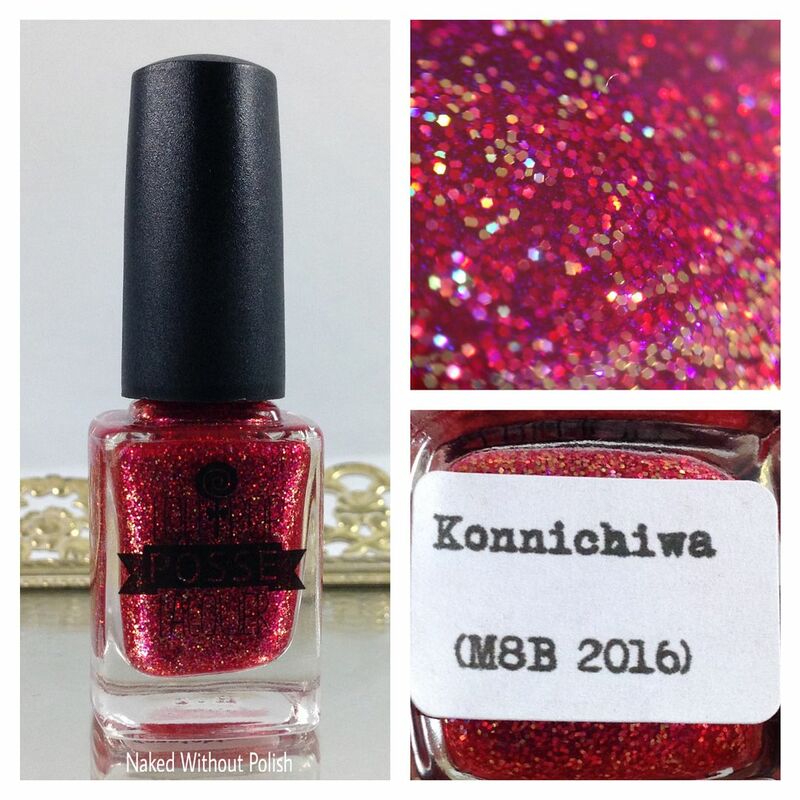 Konnichiwa is described as "an apple red jelly with blue/purple iridescent micro flakes and red holo micro glitter". 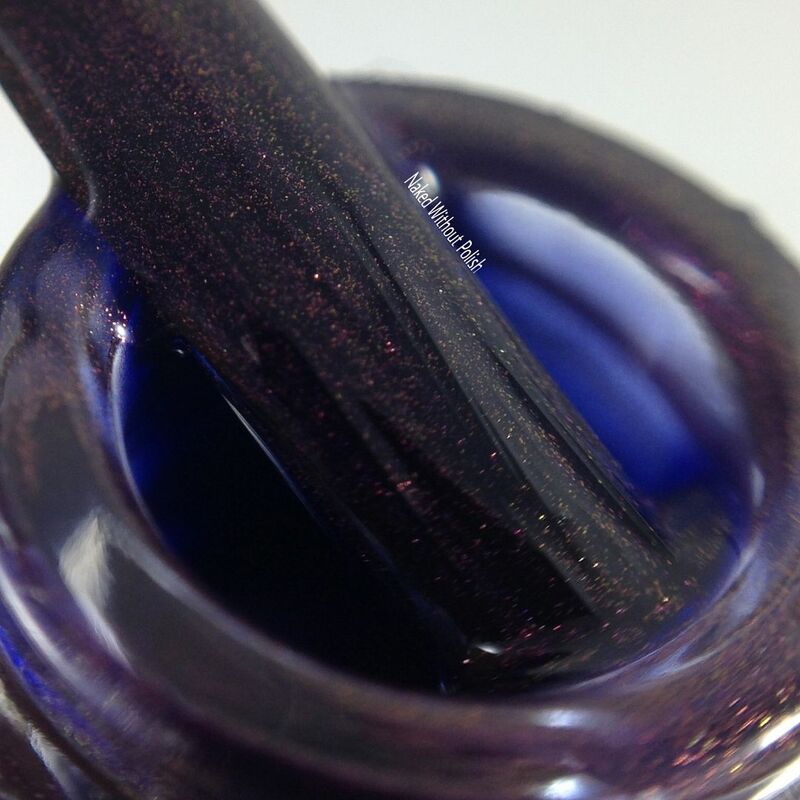 Shown is two coats of Konnichiwa with top coat. Konnichiwa is sure to put a smile on your face. The red is bold without drawing too much attention to it. 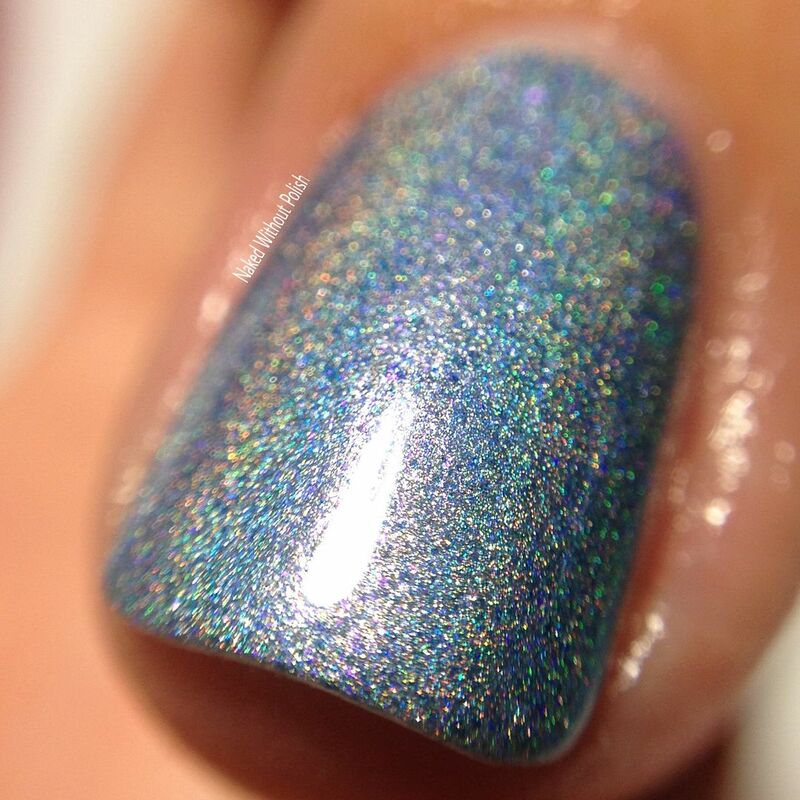 The iridescent shimmer made this polish. 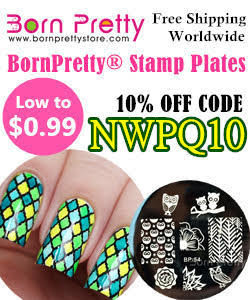 It is that perfect addition that would completely dull the polish if you removed them. 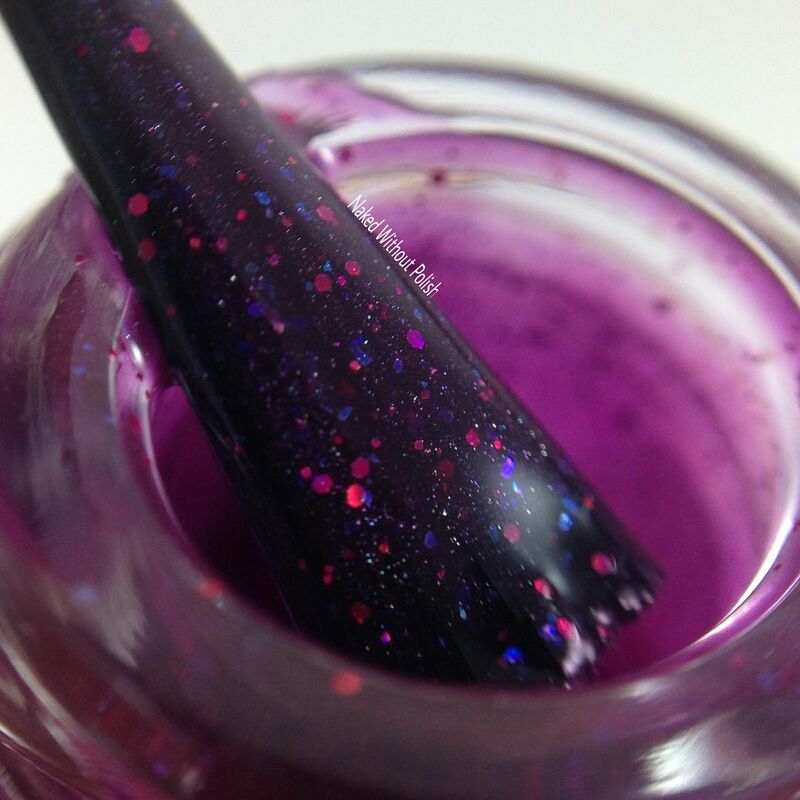 I almost did a third coat, and I kind of wish I did for a bit more glitter coverage, but the jelly is fully opaque at two flawless coats. 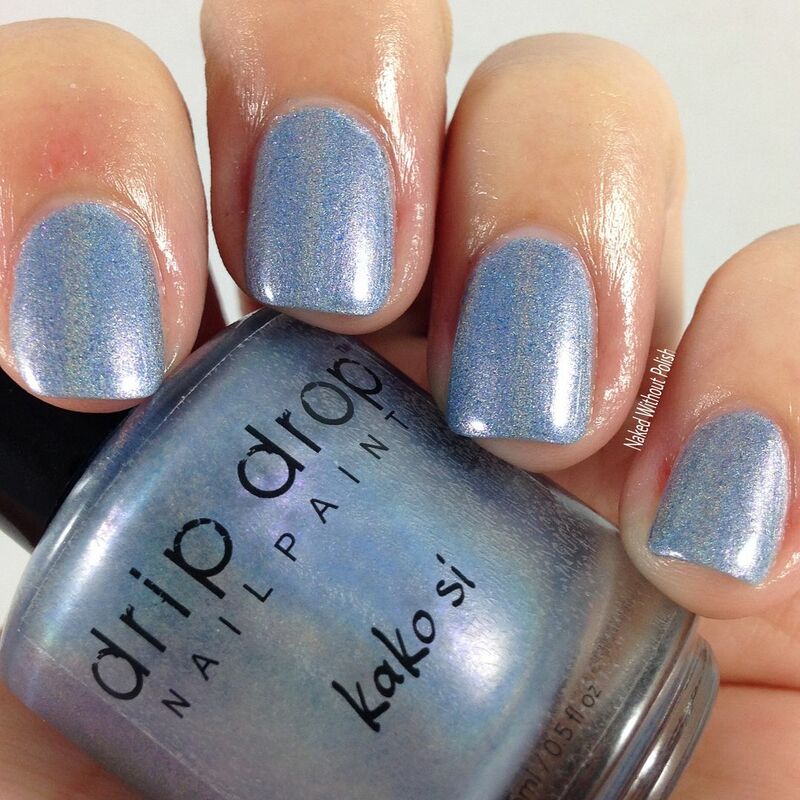 Drip Drop Nail Paint's country of choice is Croatia, and her contribution is Kako Si. Kako si translates to "how are you" in English. 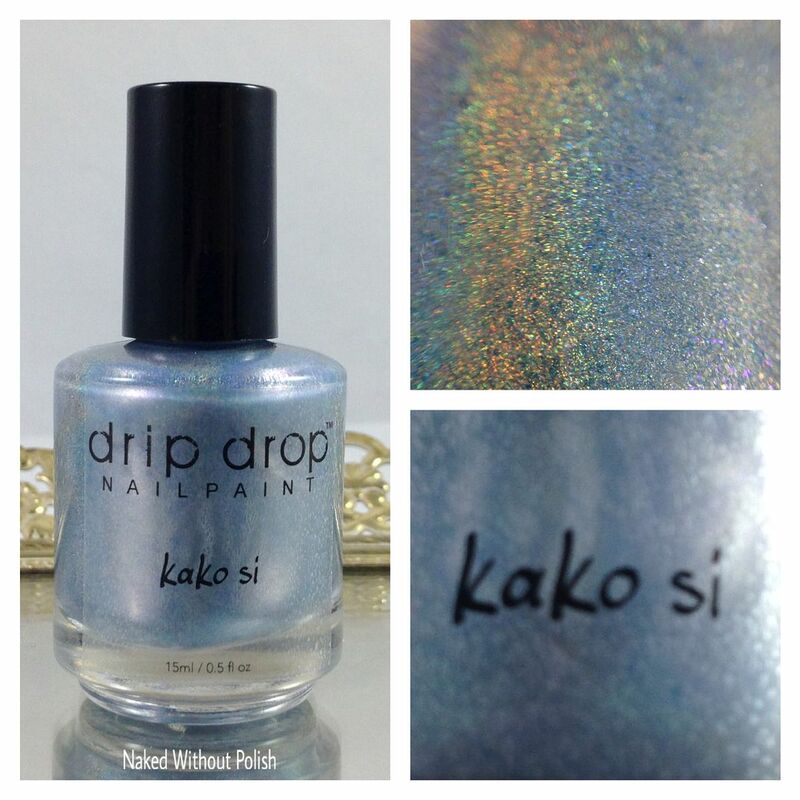 Kako Si is described as "a metallic ice blue polish filled with linear holo pigment and blue micro glitter". 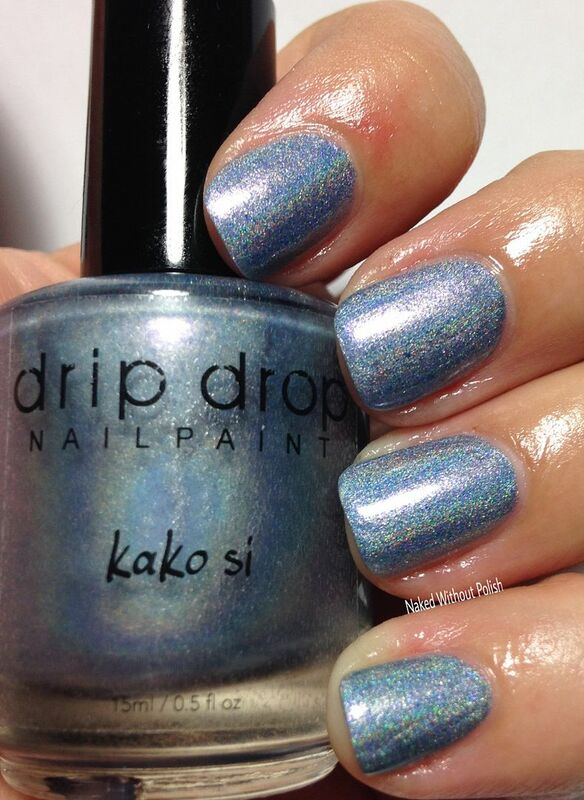 Shown is two coats of Kako Si with top coat. Kako Si surprised me. Looking at it in the bottle, I thought it was going to be too metallic for my liking. 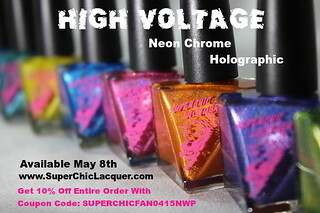 On the nail, the holo pops and makes the metallic finish less annoying. 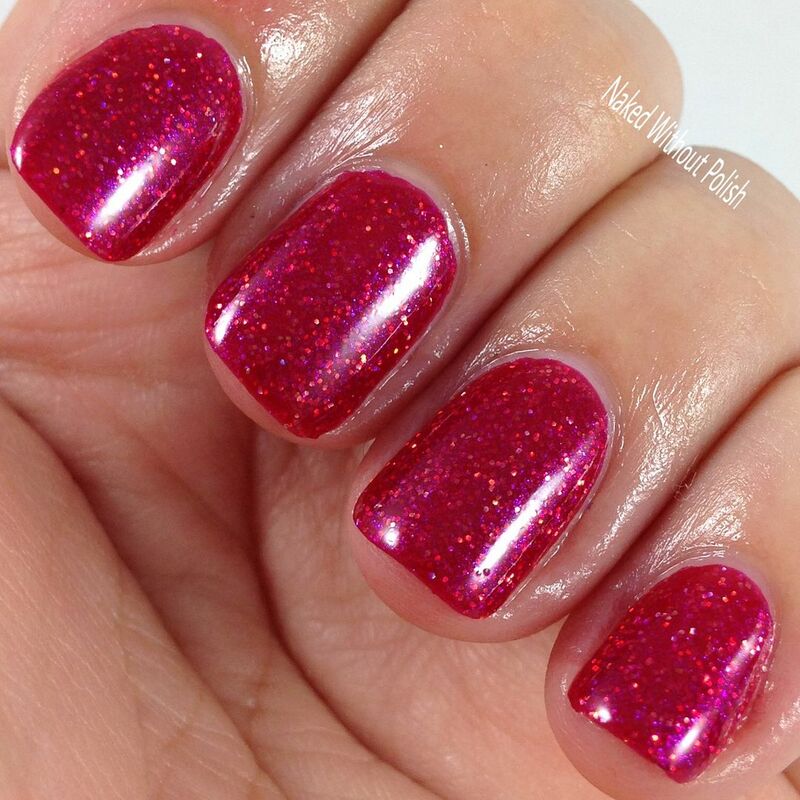 The micro glitter was the perfect addition to give this beauty a bit of dimension. Smooth application and buttery formula. 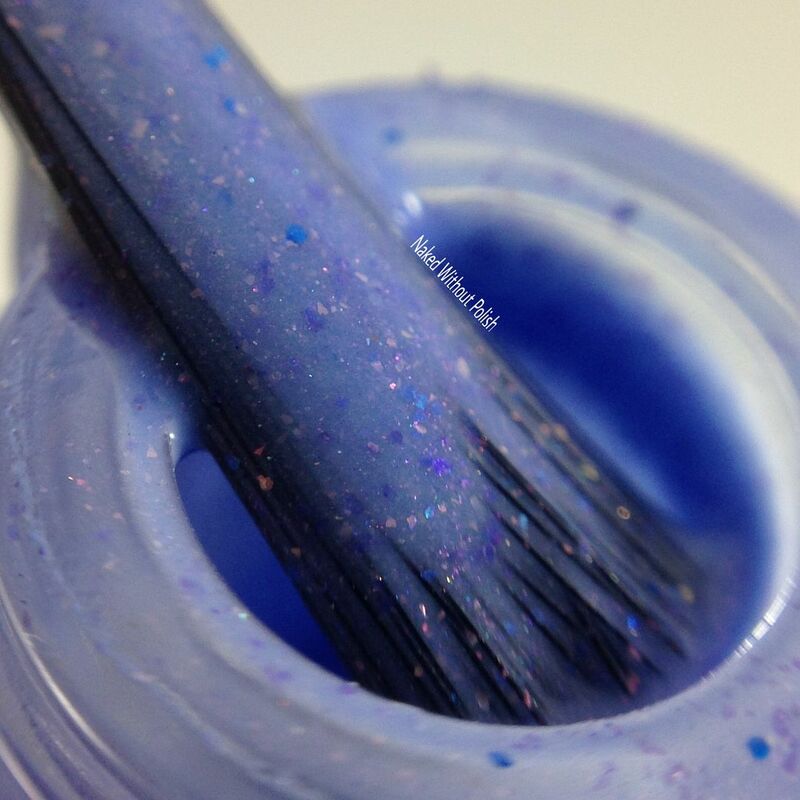 Easy to manipulate brush meant fewer brush strokes and fewer streaks in the metallic finish. 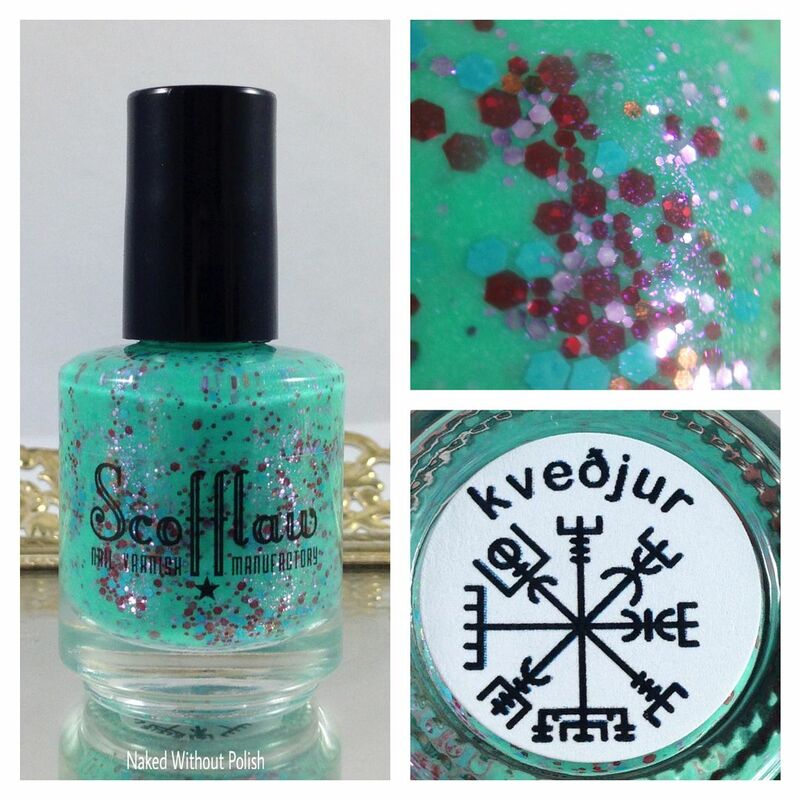 Scofflaw's country of choice is Iceland, and her contribution is Kveðjur. Kveðjur translates to "regards" in English. 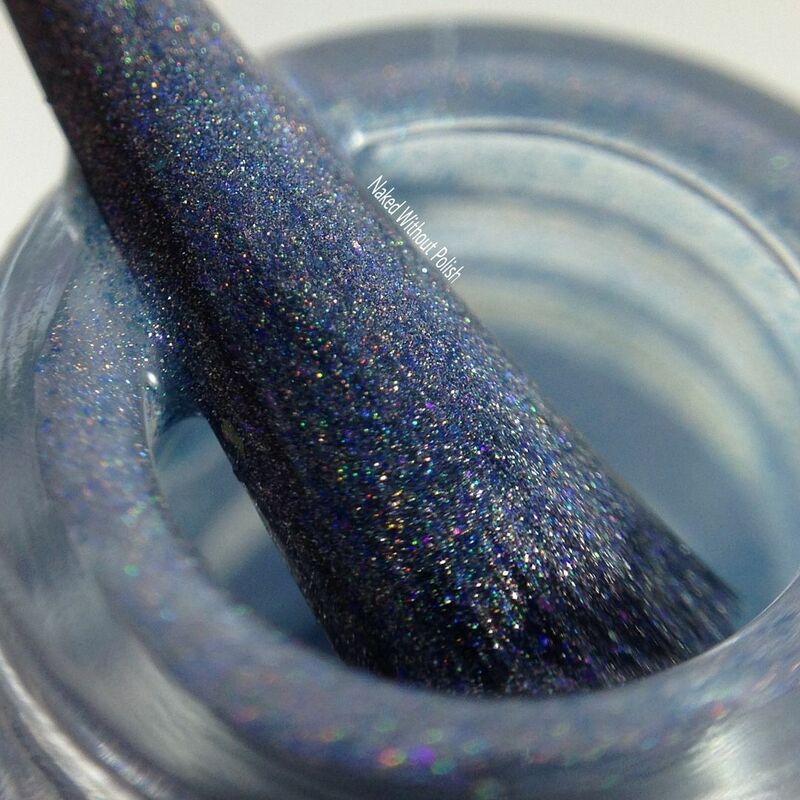 Kveðjur is described as "a pastel teal crelly with lavender, maroon, turquoise, and purple matte glitter in various sizes and a dusting of shimmer". 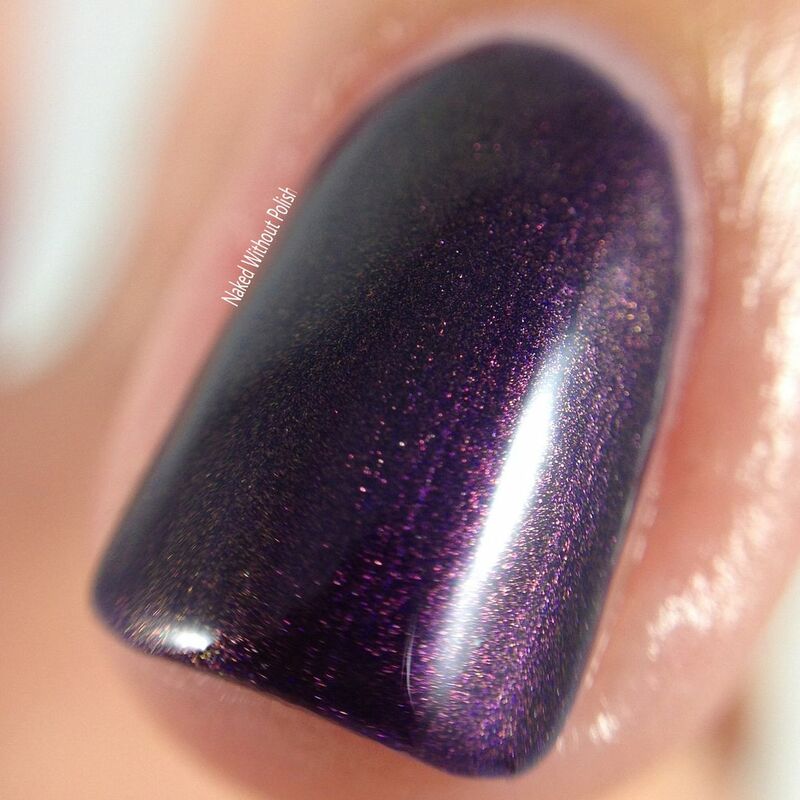 Shown is two coats of Kveðjur with top coat. Kveðjur is beautiful and unique. I did two normal coats. I almost did a third coat to get some more glitter in there, but decided against it last minute. 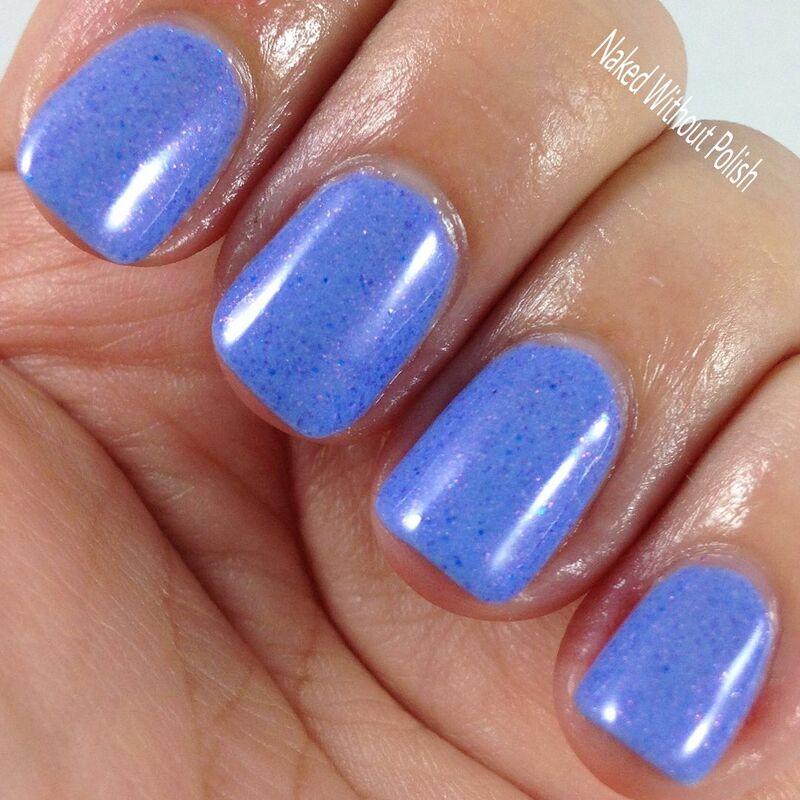 This one does dry with a slight matte finish. 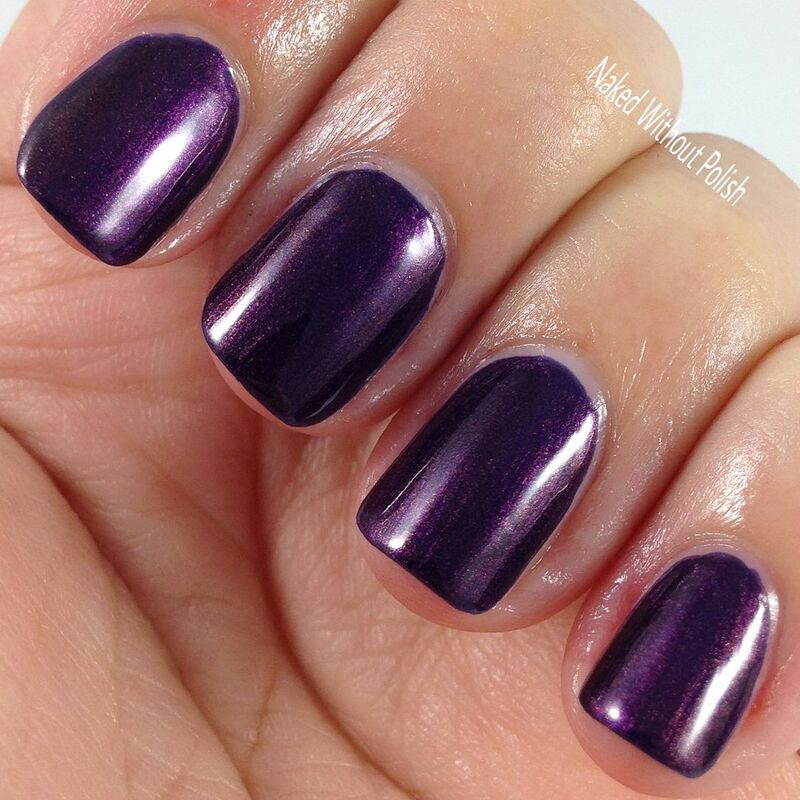 Make sure you use a glossy top coat if you aren't a fan of matte finishes. Application was great. Kinda surprising considering the amount of glitter. You won't have to fish for that at all. The maroon glitter was such an interesting choice. A perfect contrasting pop of color. 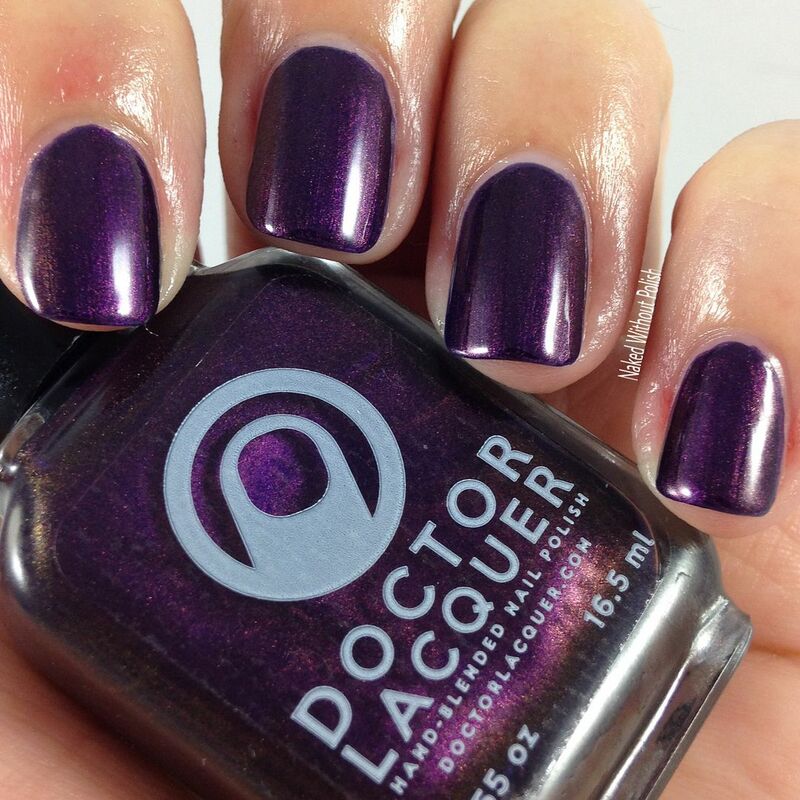 Doctor Lacquer's country of choice is Morocco, and her contribution is Salaam Alaikum. Salaam alaikum translates to "peace to you" in English. 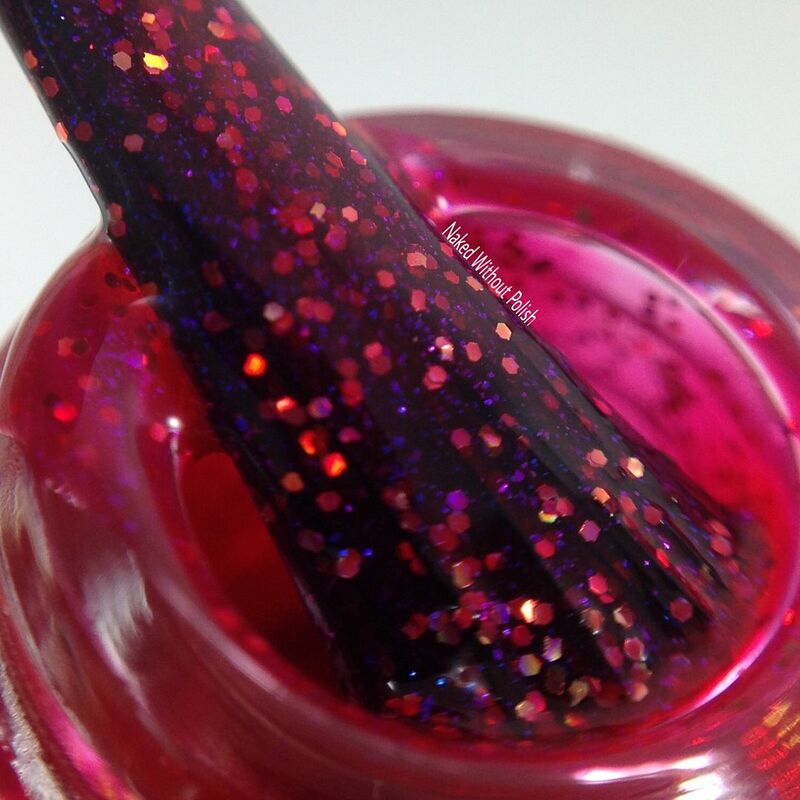 Salaam Alaikum is described as "a deep purple jelly with blue undertones filled with a shimmery red/orange shift". 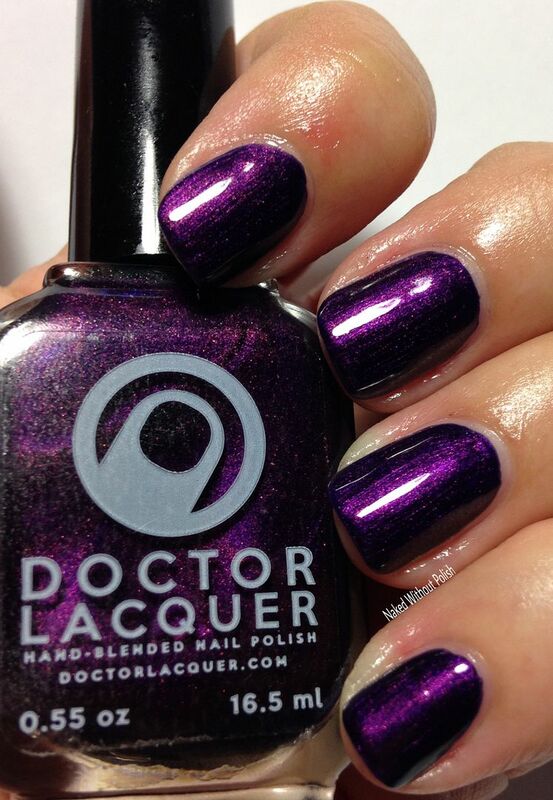 Shown is two coats of Salaam Alaikum with top coat. Salaam Alaikum blew me away! 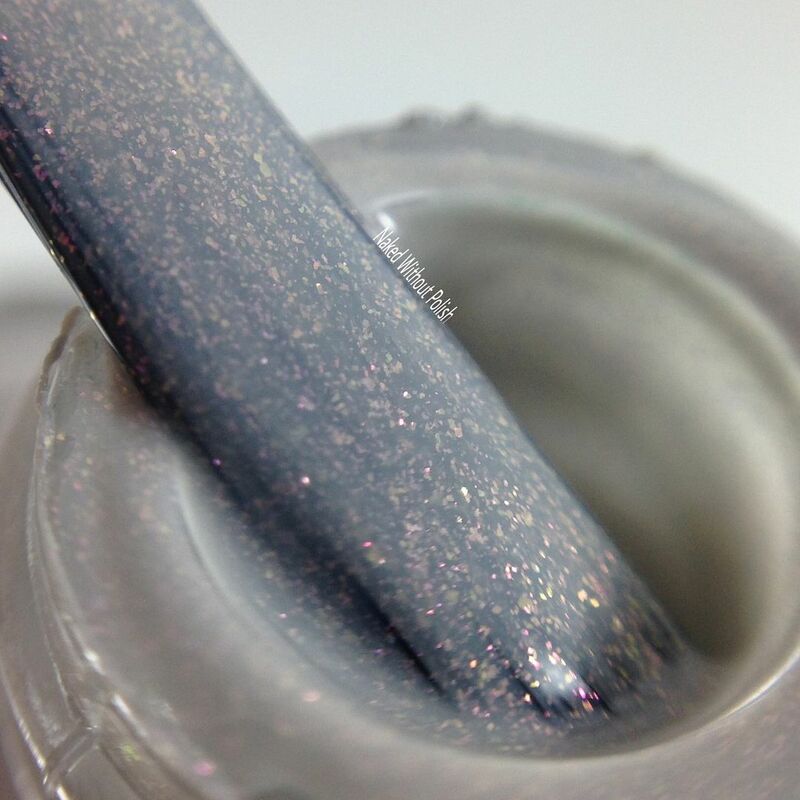 The pop of the shimmer is incredible when you get this beauty in the right light. I do thin coats so two was perfect. If you are one who does slightly thicker coats, you could easily get away with one coat on this one. 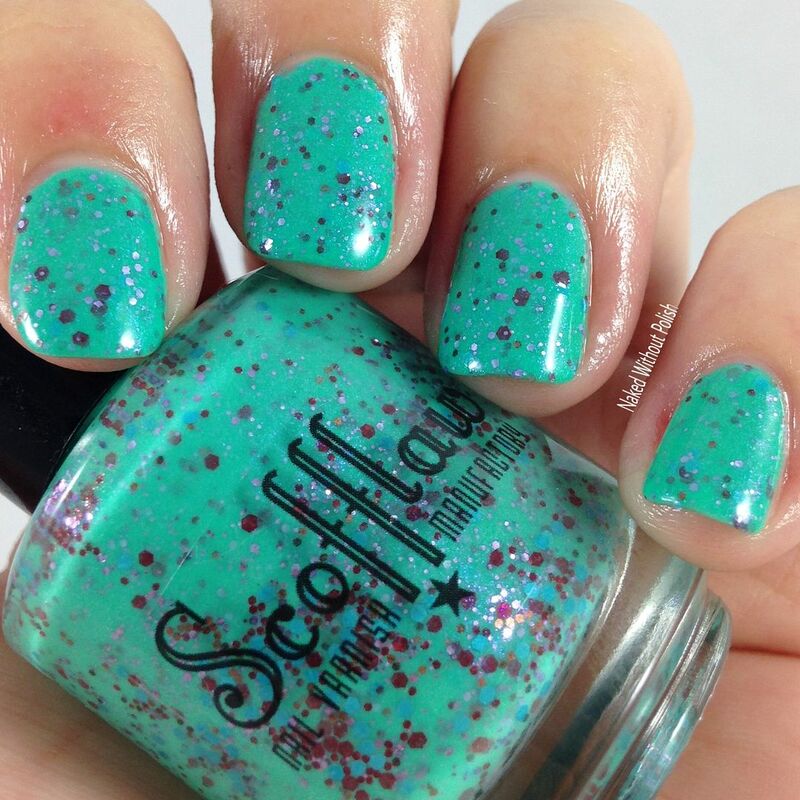 The only issue I had with this polish (other than my bottle being strangely lopsided) was the brush. The brush was so stiff it was like applying my polish with a stick. The bristles wouldn't fan out. I tried spreading them on the rim of the bottle...nothing. I tried spreading them with a toothpick...they separated in chunks for a moment then came right back together. They wouldn't do that nice simple fan you want with a nail polish brush. It's key in a smooth application. The formula was great, but application was difficult. 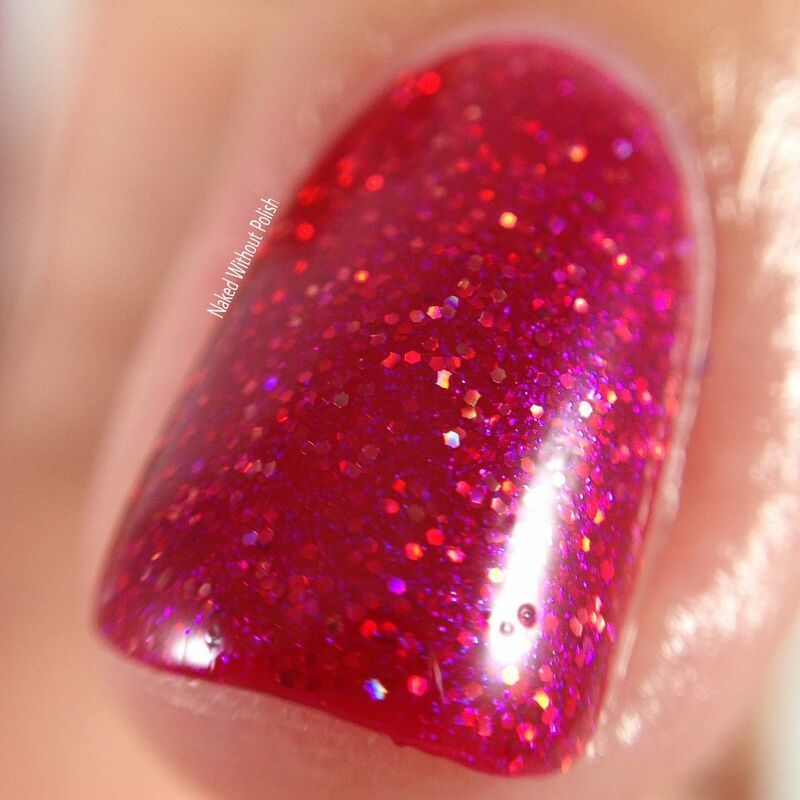 That was my only problem...nothing horrible, and it has nothing to do with the actual polish itself. Learn something new? 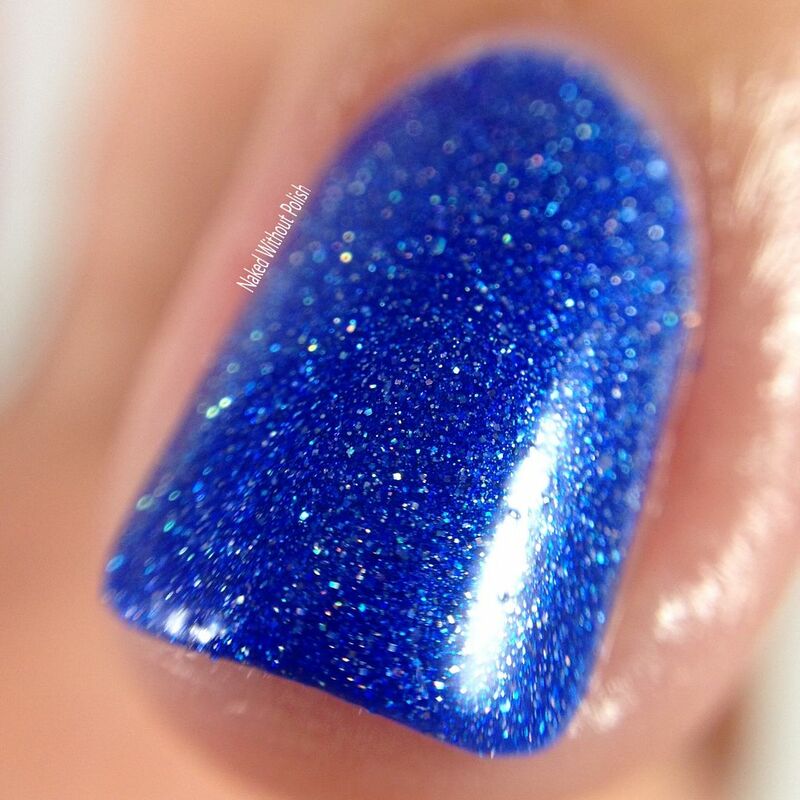 Enjoy some pretty polish? Yes, I know it was a lot going on, but you regulars know I love going into details when I can. 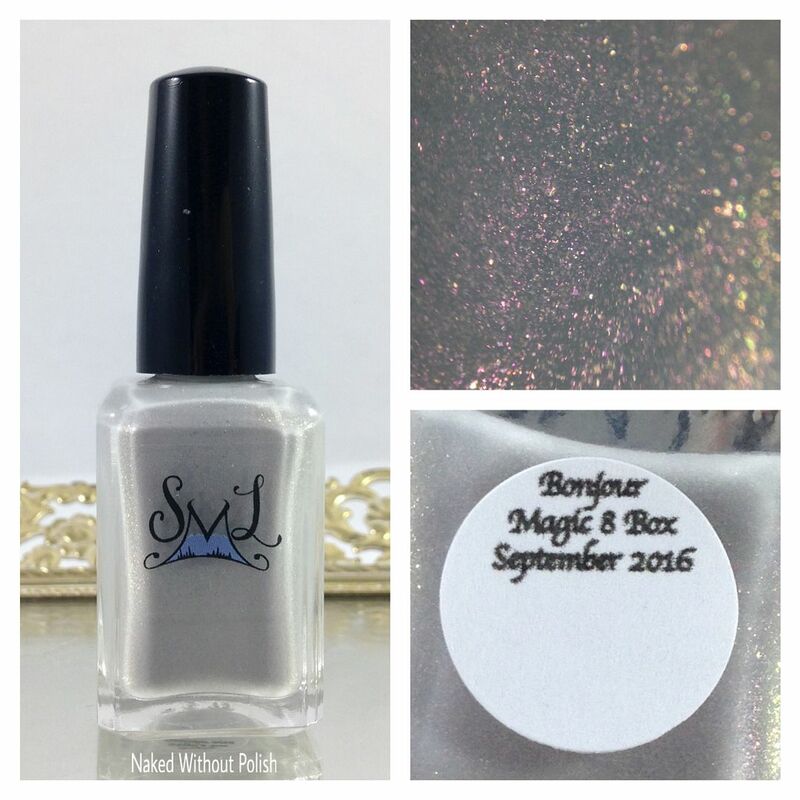 You'll be able to pre-order September 2016's Magic 8 Box on August 8th at 12 noon EST at www.phillyloveslacquer.com for $59 + shipping. The pre-order will go through August 16th at 11:55 pm EST. Make sure you claim your box in time! You won't want to miss out on these. Remember, this is a pre-order so boxes won't be shipped immediately. Make sure you are following all the brands on their social media platforms (links below) to stay updated on news, releases, restocks, and sales. Were there any stand outs to you? Any ideas on themes for future Magic 8 Boxes?